Bobbi Kristina is one step closer to following in her mom’s famous footsteps. A little more than a month after her mom’s untimely death, the famous daughter of Whitney Houston and Bobby Brown seals the deal on a TV role, thanks to family friend and entertainment mogul Tyler Perry. 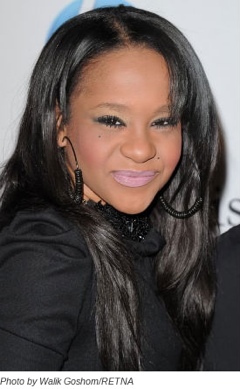 Tyler, who spoke at Whitney’s funeral and allowed the Houston family to use his private jet to bring her body back to New Jersey, has offered Bobbi Kristina a recurring role on his successful TBS sitcom “For Better or Worse,” according to Straight From the A. Bobbi Kristina will be featured in a recurring role as the daughter of one of the stylist’s in the beauty shop owned by TV character Angela (Tasha Smith). Bobbi has even been spotted on several occasions at Tyler’s Atlanta based studios. Pat Houston, Bobbi’s aunt and her mom’s former manager, sister-in-law and best friend has also been seen on the premise. There’s speculation that Pat was there to manage and negotiate Bobbi’s contract. Based on his movie Why Did I Get Married? and sequel, Why Did I Get Married Too?, the sitcom has been picked up for a second session. TBS has ordered 35 more episodes, which will begin airing in July. News of a TV career is a good look for young Bobbi Kristina. Dad Bobby Brown on the other hand, recently made headlines for a bad role—an alleged DUI. It is rumored that Whitney’s mother and Bobbi Kristina’s grandmother, Cissy Houston felt her the news of Bobby Brown’s arrest confirmed her allegations that he was responsible for Whitney’s demise.